Pretty much the subject says it all. How can I make a task repeat on the end of each month in google calendar. Behind both DTSTART and DTEND, write the date of the first occurrence of the event. Then, put the name of the event behind SUMMARY. Your event now appears on the 30th or 31st (or 28th, 29th) of each month, depending on the month. You can also schedule it for the last business day by dropping SU and SA in the BYDAY. You can still edit the name and time of the event (the UI is a bit glitchy, messing up your dates by default, but it works), but you cannot edit the recurrence: "This event has a recurrence rule that cannot be edited in Google Calendar"
P.S. If you want to dive deeper into making your own rules for when an event should occur, such as "first business day of the month", take a look at RFC 5545, section RRULE for examples and section RECUR for a formal definition. With this you can edit the RRULE line to your liking. See the comments on this answer for some examples as well. You can do this with the OS X Calendar app. 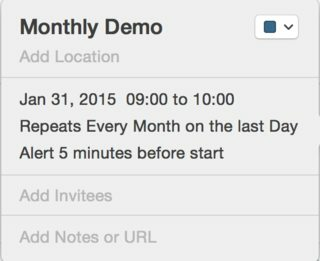 First, sync your Google Calendar with OS X Calendar. Then create an event series that occurs on the last day of every month and wait for it to sync to Google Calendar. 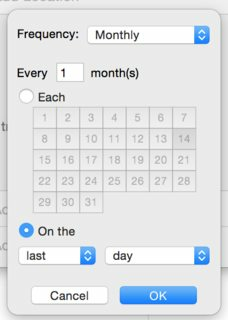 Another partial solution that may work for some folks: Create the repeating event for the first day of every month, then add a reminder for one day in advance. Then you'll receive at a notice regarding the event at the appropriate time. Of course this doesn't help if you need the time to show as busy. This will create an event called “RORO at Inspire9, Richmond”, with the location field set to “Inspire9, Richmond” and the repetition set to “Monthly on the last Thursday”. A highly similar and more general question is "how to make an event repeat on the last [x] day of each month". As this person noted, you need to find a month with the max number of weeks (five) and then set it based on the day of the month. If the initial month doesn't have the max number of weeks, it will repeat on the fourth week rather than the last week. Pattern Monthly > The (Last) (day) of every (1) month. I found that the Google calendar app allows for end of every month scheduling. I now schedule most events from my phone. 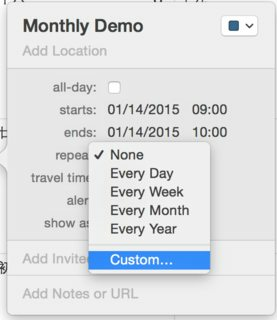 Under Repeating option select Custom and it will allow you quite a bit of flexibility. It still does not distinguish between calendar days of the week and business days of the week like Apple Calendar. I would love to see this addition. Google will only import .ics files and all that necessary is after creating the event in a .txt file change the extension to .ics and it can be imported. How to make an event repeat on the third last working day of each month in Google Calendar? How to make a task repeat on the last day of each quarter in Google Calendar? How can I add a yearly recurring event on the last Saturday in a specific month? Google calendar: last Saturday in February, each year? How can I change task color in Google Calendar?